Vane-Wright, R. I., and P. R. Ackery (eds.). 1984. The Biology of Butterflies. Symposium of the Royal Entomological Society, London. pp. 429. Boggs, C. L., W. B. Watt, and P. R. Ehrlich (eds.). 2003. 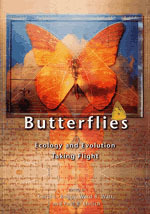 Butterflies: Ecology and Evolution Taking Flight. Chicago University Press, Chicago. pp. 756.